Had a bad weekend with technology. Internet has been spotty the last few days--BSNL tried to fix it but still isn't working properly-- and then, in a separate disaster, my computer crashed on Saturday night. Will post in a few days when I've gotten everything up and running again. In Delhi some expats live in farmhouses which often have acres of property around them. You can rent an elephant for a day to come to your property to just hang out and entertain you (or to ride around your campus), for less than $100 a day. Buses here "ply" routes. I have never seen the word used so much in my life as here, but always (and almost exclusively) to describe buses: for example, "buses regularly ply the route between Delhi and Agra." The caste system is alive and well in some Indian companies, which have a preference for certain groups (e.g. Brahmins). Everyone seems to know which companies these are, but names are not mentioned. It is said that an arm put around the shoulder by a supervisor at such a company may not be a sign of encouragement, but an attempt by the superior to detect the sacred thread worn by Brahmins. Surrogate mothers are the latest in outsourcing. The Indian Council of Medical Research, which is codifying the legal aspects of egg donation and surrogate mother arrangements, believes it will mushroom into a $6 billion business. A surrogate mother in Delhi gets between 2 and 4 lakhs ($5-10,000) compared to $20-50,000 in the U.S.
"Dear Friends. My sighting in the wild is a matter of chance. Single-minded objective for me during park visit may disappoint you in a great way. I request you to enjoy this park in its total wilderness." Over the last few months, the work visa renewal process in India has changed. At first it sounded like an improvement: you no longer had to leave the country, but could renew through the local Foreign Registration office. However, just about everyone I've talked to using the "new process" has had problems, with a ton of bureaucratic drag and lack of accountability between the FRROs and the Home Ministry in Delhi. Worse, it's no longer even an option to renew abroad, but must be done in country. Some have said that the change is a deliberate attempt to discourage foreigners from working here. I don't know if that is the case, but the lack of clarity around the whole process has been frustrating to many. (It doesn't affect me personally because my own visa is good through early 2008, by which time I will have returned to the U.S. anyway). There is also a lot of variability abroad in the practices of the Indian consulates and embassies with respect even to non-work visas. Some are pretty quick and reasonably efficient--London and New York are mentioned as examples. Others, like Chicago, can't even manage a simple tourist visa---in both Lia's and Sara's cases, it required a trip there to arrive early in the a.m., and then stand in line and wait--and wait. Sara's, sent before Thanksgiving express mail, hadn't even been opened early in late December when Marty and she drove down there finally concluding that they had to handle it in person. The person at the counter said they had not gotten to January visas, so if anyone was traveling that weekend, they were probably out of luck unless they did what Marty and Sara did, and show up in person. If the country wants more tourism, they are going to have to make it more user friendly. Americans don't need a visa at all for Thailand or Japan, and if you want to visit Australia or even Cambodia, you can get an visa online these days. I guess people here would say the same --or worse--of the rigmarole the U.S. demands of our foreign visitors. However, this doesn't excuse what is a very inefficient and difficult process here. India has been able to automate the train ticket business quite efficiently, so it's certainly within the realm of the possible to do the same on tourist visas. I never did finish writing about Lia's and my trip to Rajasthan, especially the trip to Jodhpur. 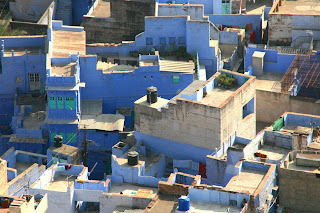 As Jaipur is called "the pink city," Jodhpur is known as "the blue city." You don't have to be there long to understand why. As the photo shows, building exteriors in the old city are awash in blue. This has an interesting history. A section of the town was occupied by the Brahmins (highest Hindu caste) and they washed their houses in blue to identify themselves. Over time, non-Brahmins also adopted the distinctive coloring for its practical application--keeping cool in the hot Rajashthan summers. The train station in Jodhpur, which Lia and I experienced because we took the train from Jaipur, is probably one of the sleaziest I've seen here. In the main lobby, hundreds of people, most looking like beggars, were sleeping when we arrived shortly after midnight. Touts were all about, and it was a good thing I had arranged for the hotel to pick us up, especially since the hotel was almost 10 kilometers outside the city. The most imposing and impressive feature in Jodhpur is the Meherangarh Fort, which overlooks the city. In retrospect I was glad I chose this place to visit with Lia, because the climb would have been difficult to impossible for either Roberta or Marty. The climb is worth it, though--the view of the old city from on high is breathtaking. And yes, the origin of jodhpur riding pants is this city, which is world famous for polo. There are museums and lots of pictures from the days of the Raj, and if you're so inclined, you can even have a pair made while you wait. (I didn't).